I provide Supervision for counsellors who are based in Sheffield at my Sheffield Practice. I can also offer supervision for counsellors via Skype, telephone and email. I aim to be your mentor by providing a supportive supervisory relationship. I will provide guidance as well as emotional support. Provide a safe space where difficult clinical and ethical issues can be discussed and processed. Provide support and advice when personal issues have surfaced during their work with clients. Help you focus on the challenges you may face as well as celebrate any successes you have. I hold a British Psychological Society Certificate in Clinical Supervision, and bring over 14 years experience as a private and affiliate counsellor. I run a successful counselling business and manage my own website. I have managed to put my website high in search engines and I am willing to share this experience, along with my other successes as part of my supervision. I charge £75 per supervision session (1 hour and half) or £50 for 1 hour. I may charge extra for evening slot appointments. Supervision is offered in my practice room at 59 Wostenholme Road, S7 in Netheredge Sheffield. I offer Skype supervision. As an online counsellor myself, I understand the differences in online work and can support you with this work. Skype voice is encrypted and offers you confidentiality. I receive regular supervision for all my work. 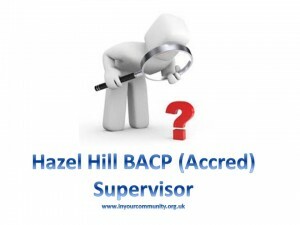 As an accredited counsellor I can help supervisees with their BACP accreditation and as I have previously taught on counselling diploma courses, I am well placed to help counselling trainees.